Those who follow my work know that I love HDR. It's a great tool, but it's not always the best way to capture and process an image. When I look at a scene that I want to capture, I try to evaluate the dynamic range and decide whether it would be best to capture a bracketed set of images. I'm getting better at guessing things like how much EV range I need to capture to adequately represent the dynamic range in my subject. 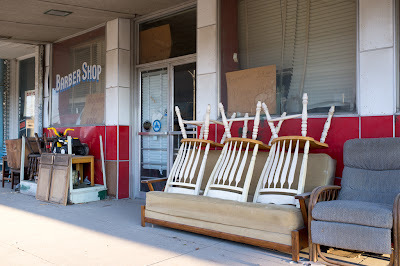 The barber shop store front above is an image created from a single raw capture with my Fuji X100. I almost always shoot in raw format for the most control over my post processing workflow. In my estimation, I only needed one exposure because the area was lit fairly well by the low sun behind me. The sidewalk might have blown out if anything, but when I looked at my histogram there was no highlight clipping. Satisfied with the exposure, I moved on. Later, while processing my raw capture, I decided that the image was looking a little flat. I played around with contrast curves in Photoshop and experimented with some of my plug-ins. Nothing really looked "just right." I decided to run the raw file through Nik HDR Efex. Now, I have to admit that I'm not really crazy about HDR Efex. The looks it creates always look a bit too harsh for my tastes and I favor Photomatix for HDR tonemapping. For single raw file work though, I think HDR Efex does a better job than Photomatix for whatever reason. Normally, I like a touch of the surreal in my images. I'm not going for a blatant painterly look, but I find that giving just ever so slight of an illustrative look to my HDR images makes them a bit more engaging. For this image, I thought it best to lean more toward the side of a natural look. While HDR is most often used for compressing dynamic range, it can also bring out a lot more detail in an image. This is something I had to be careful with in this image. It is easy to go overboard with detail and make an image look too grungy or cluttered. There is a lot of dirt and texture in this image - on the windows & blinds, on the fabric of the sofa and chair, etc. It would be very easy to bring out too much detail of the dirt & grime and end up with a muddy image. What I chose to do was selectively blend in some of the HDR rendering with the "normal" rendered raw file. I wanted to add some pop to key areas, such as the fabric on the sofa and chair, without bringing out every last bit of detail in less important areas like the sidewalk or ceiling. The result is a very subtle HDR image. It is "plausible" as a representation of the scene, but it contains more detail and slightly boosted color over the original. Here is what the image looked like prior to HDR blending. The difference is subtle, but there is a significant improvement over the base capture (you can click the images for a larger view.) Next time you have an image that looks like it's lacking something, considering processing the raw file (you do shoot in raw, don't you!) with HDR software and blending the tonemapped version with your original. It may be just the extra bit of kick you need to improve a blandish image.